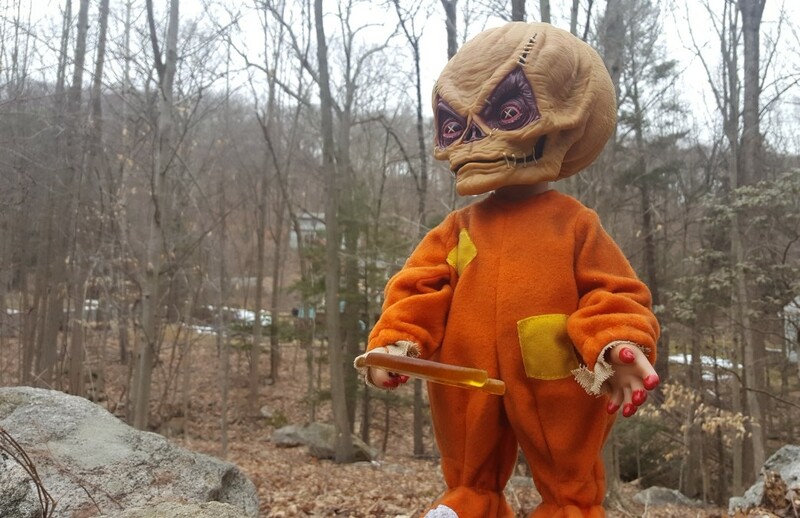 Mezco Toyz 15" Mega Scale 'Trick 'r Treat' Sam: The Horror News Network Review - Horror News Network - The Horror News You Need! I recently got my hands on this little devil, and I’m impressed by all of the textures of this mixed-media creation. My first impressions when the delivery person dropped Sam off at my doorstep was just how large he is! The box had a certain weight to it that you don’t always see with modern mass-produced collectibles. 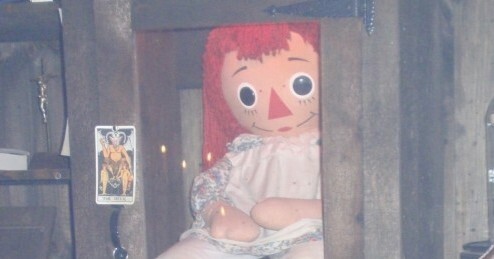 Sam comes in a large and sturdy box with a nice window that “mint in box” collectors will surely appreciate. Almost the entire hooded critter is easily view-able and the minimalist packaging would look nice on any shelf. Mezco stuck with a subtle color palette and subdued imagery from the film which captures the feel of the movie while allowing Sam to be the true center of attention. The box is sturdy and attractive, and it’s worth hanging on to even for those collectors who will never be putting their rascally new friend back in it ever again! I could barely snap some pictures of Sam in his box before (carefully!) tearing open the lid and freeing him from his twist ties! I was immediately impressed by all of the different fabrics of Sam’s iconic clothing. 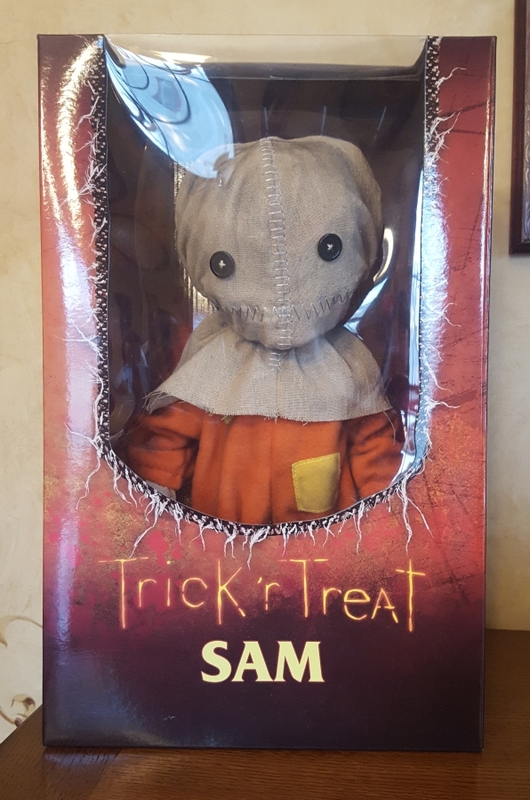 Mezco is known for their Living Dead Dolls line, and they’ve clearly applied their expertise of the format to the creation of Sam. 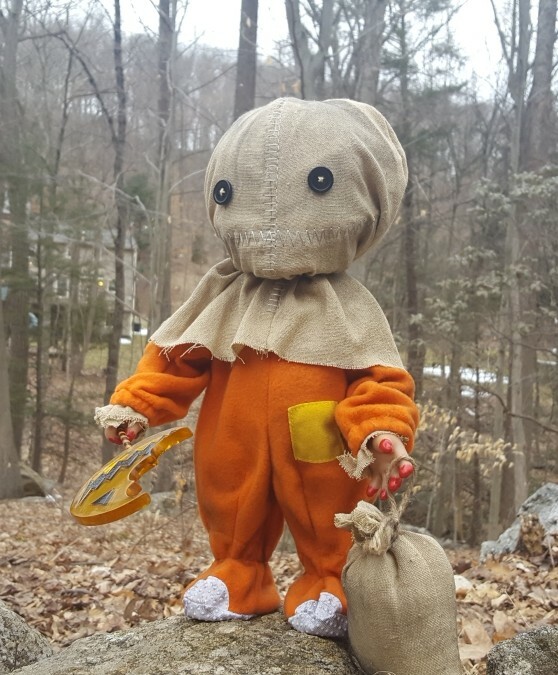 His patchy orange PJs have a worn-out fuzzy quality that feel like you might find them at the bottom of an old clothes pile at a tag sale, and his burlap sack mask has lifelike dirt and grime applied to its nooks and crannies as if it had been housing rotten potatoes just minutes before being pulled over Sam’s putrid pumpkin head! From the coarse bottoms of his footie pajamas to the bristly twine of his drawstring sack, this figure is a sight to behold and a treat to touch! Underneath his homemade mask lies a face that only a mother could love… which is a high compliment to Mezco, given the source material! The vinyl portrait is very close to what we saw on screen only in shadows, and lots of attention is given to his creepy eyes and nose. I prefer that my collectibles don’t have stylized portraits, and I love that Mezco stuck with the visage of the Sam we all know and love without getting to experimental with the head sculpt. The paint is nicely applied, and Sam’s eyeballs have a great design going on in them. Those looking for an extremely detailed paint job on the face may be disappointed by the flatter finish and uniform tones on most of the head; but for the price point of the figure, it gets the job done and it looks great from normal viewing distances. There are no paint blemishes or careless errors which can sometimes be found on collectibles three times the price. 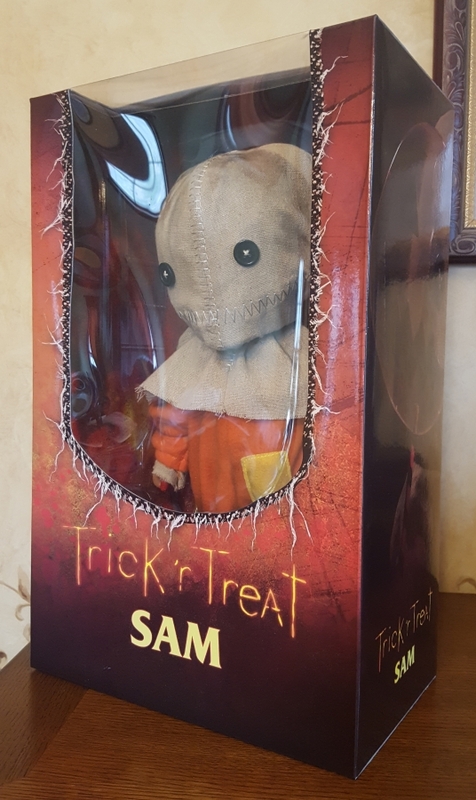 The blood spots on Sam’s fingers have a certain shine to them that causes them to always appear disturbingly fresh, and his murderous lollipop has a translucent quality to it that hits the light wonderfully in all of its sharp edges. Sam looked wonderful from every angle when I tried to capture some shots of him in his natural environment… among the crisp rotting leaves and the twisting trees of the dead season! When the light hit him just right, it was as if he was dragging his bag of treats in from the woods to celebrate another twisted Halloween! 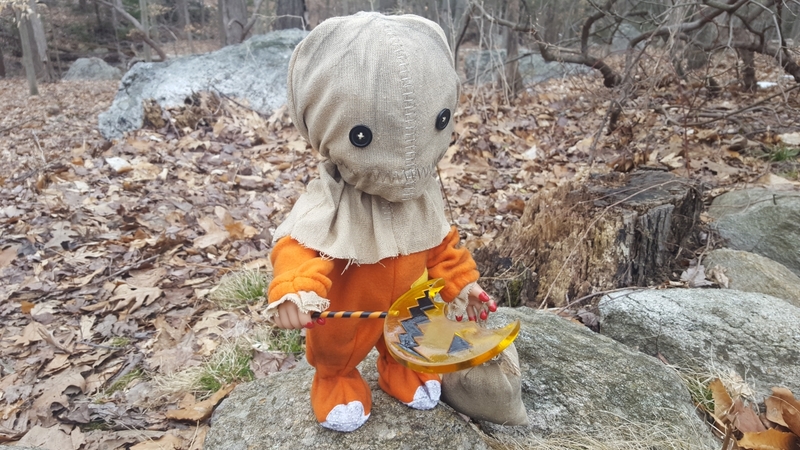 The Mezco Toyz 15″ Mega Scale Sam is a perfect collectible for the Trick ‘r Treat fan who has always dreamed of taking the little guy home without suffering any of the consequences of coming face to face with the real thing! He will make for an excellent Halloween prop, or a permanent addition to the discerning horror fan’s room of creepy crawlies! 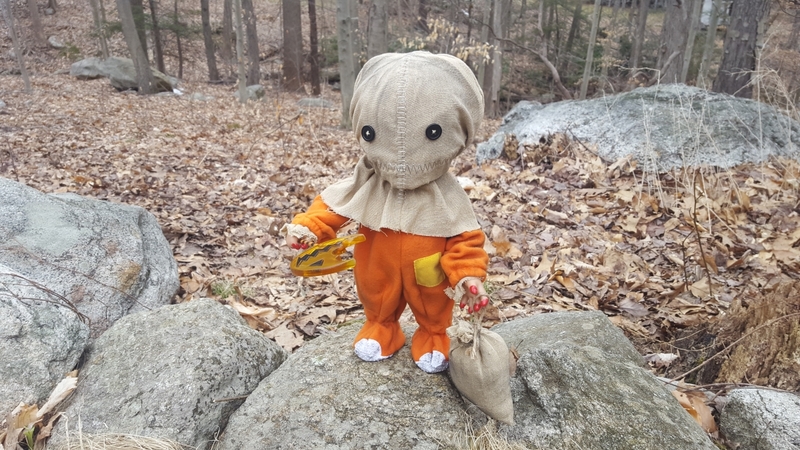 Plain and simple: if you love the movie, you’ll adore all of the work Mezco Toyz put into bringing Sam to life with a variety of earthy textures! 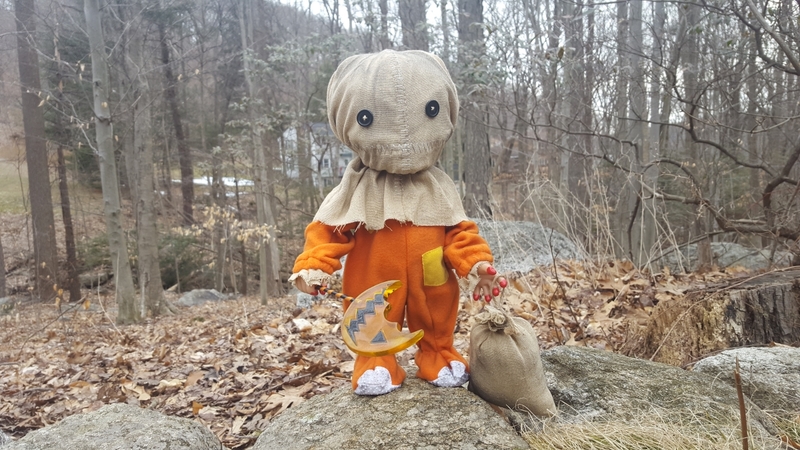 If all goes well, Sam is set to return to horror cinema in the previously-announced Trick ‘r Treat 2. Michael Dougherty recently revisited the world of holiday-centric horror with 2015’s Christmas monster-mash, Krampus. 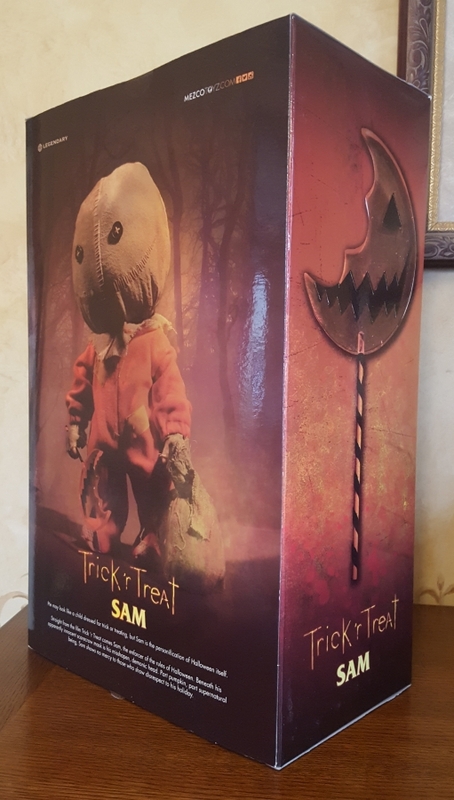 Hopefully, Trick ‘r Treat 2 will be next on his list after his upcoming big budget production of Godzilla: King of the Monsters, and fans will want to make sure they have the Mezco Toyz Sam in their collections before then to avoid paying aftermarket prices later! 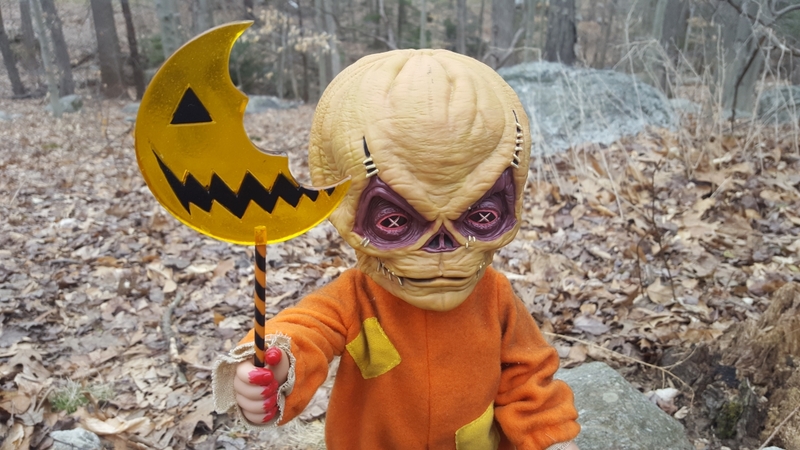 Stay tuned to Horror News Network for complete coverage of Trick ‘r Treat, the cinematic world of Michael Dougherty, and Mezco Toyz’ upcoming creations!